Before you send your quote to the client, you should preview the content to ensure that it is ready to send. Projectopia provides a Quote Preview page which allows you to see what the quote looks like before sending. To access it, click the “Preview Quote” button in the Quote Status metabox. On the image below we have highlighted where each section in the Quote Metaboxes article appear on the quote. TIP: The Quote Preview gives an example of the actual quote content (The printable version of the quote). 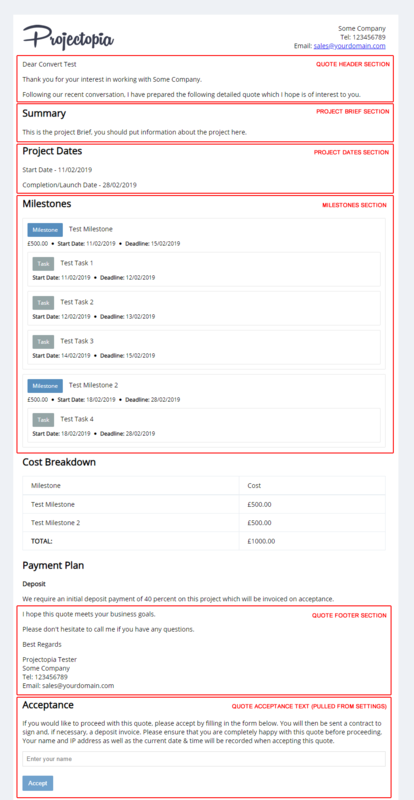 When the client views it, it will be displayed within the dashboard.